Heralding the entrance from the Atlantic Ocean into the shipping channel between North Island and South Island stands the oldest lighthouse in South Carolina. For two centuries, mariners have passed this lighthouse on their way to or from Winyah Bay and the Seaport of Georgetown. On a sunny, clear day, the North Island Lighthouse – or Georgetown Light, as it has sometimes been called – is visible from Belle Isle Marina as a tiny iridescent white column. At night, the beacon is discernible from the same vantage point as a tiny, intermittent point of brightness. 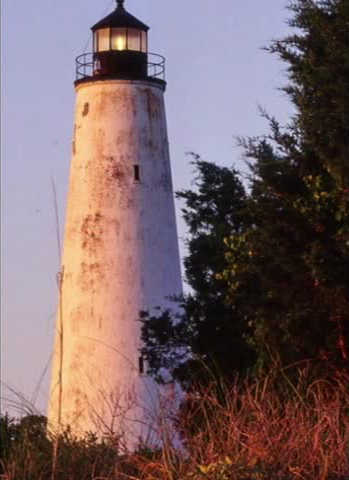 Viewed at close range by boat, or from the beach below, Georgetown’s only pharos, or lighthouse, towers above the gnarled live oaks, fragrant cedars and salty marshes. The structure’s gracefully curved, pale sides, appearing preternaturally white and smooth from a distance, are, in fact, richly textured from weathering the ever-changing Atlantic coast’s extreme conditions. Inside the lighthouse, the first of 120 spiraling steps begins close to the entrance. These stone steps curve up through the tower’s stark gray and white interior, punctuated at every revolution by a deep window casement. The casements become thinner with elevation, as the wall’s thickness decreases from 5-and-a-half feet at the base of the light to 2 feet thick near the tower’s peak. At each turn in the winding stairway, the casements open onto an increasingly aerial view of the North Island, Winyah Bay, and the ocean. Crowning the tower is the light room, reached through a steel trap door at the top of a worn wooden ladder. Here, in the peak of the lighthouse, a rotating beacon sends a sun-bright blast of light once every several seconds. Ten large windows emit the light beam to every point of the horizon. Prior to electric illumination, whale oil, then kerosene, was burned for the light. Until 1999, the light beam was magnified, for more than a century, through the concentric rings of prisms of a fifth-order Fresnel lens, now on display in the South Carolina Maritime Museum on the waterfront in downtown Georgetown’s National Register Historic District. A succession of lighthouse keepers have climbed through the trap door into the light room during the more than two centuries of lighthouse service. During the Civil War, Confederate lookouts kept watch for Union ships before destroying the light room so the invading Federals could not use it. Soon Federal soldiers breached the tower to raise the Union flag over North Island. However, the Georgetown light was shining long before the Civil War. The story of its construction dates back to the last years of the 18th century. In 1789, Revolutionary Patriot Paul Trapier, then owner of North Island, donated land on the island for a lighthouse. During the 1790s, the federal government launched the Lighthouse Service, a program of lighthouse construction along the east coast. Until then, the southeast Atlantic coast had only two lighthouses: one at Tybee Island, Georgia, off Savannah, and the other at Morris Island, off Charleston. Georgetown residents had long been wanting a lighthouse to mark the entrance to their harbor. Not only, they realized, would such a beacon increase maritime trade by marking the approach to Winyah Bay and the Seaport of Georgetown, it would also make such trade safer. Ship’s pilots needed a lighted landmark to fix their approach on when navigating the difficult passage over the Winyah bar and when sailing in the vicinity of the bay’s treacherous shoals. Many ships had run aground attempting to make the port of Georgetown, and merchants feared the lack of an entry beacon here resulted in many ships sailing on to the port of Charleston instead. In 1798, Congress accepted a bid of $6,250 for the construction of a lighthouse on North Island. Their total allotment of $7,000 dictated that a wooden tower be built. Congress would not allow more money for a masonry structure, maintaining that wooden lighthouses were sturdy enough, and less prone to dampness than their stone counterparts. As an example, they cited the recently built wooden lighthouse at Cape Cod. Construction was begun near the tip of North Island with Daniel Steven, superintendent of the Charleston lighthouse, in charge of construction. North Island’s proud new beacon was a 72-foot wooden tower on an octagonal 26-foot diameter brick base. Near the peak of the structure was a 12-foot wide wooden platform covered in flagstones. On these flagstones rested a 6-foot diameter iron lantern housed in thick glass. A trap door led from the lantern room down into the body of the lighthouse. Five flights of stairs – with two windows at each landing – spiraled to the ground. The pinnacle of the lighthouse was completed with a copper ventilation system and lightning rods. A two-story keeper’s cottage and a whale oil holding tank were built beside the new beacon. In August of 1806, a fierce gale – or perhaps even hurricane-force winds – brought down the wooden beacon. Six months later, Congress alloted $20,000 for a new tower – this time built of brick or stone – to be built on the site of the fallen structure. By 1812, the present lighthouse was completed, built according to plans very similar to those of the original structure, but taller and with, of course, the substitution of stone for wood. The new pharos was secured in a 50-foot-deep base filled with a sand, oyster shell, lime and water mixture called tabby, which is stronger than even modern cement. Since then, the lighthouse on North Island has shone its beacon while withstanding the whimsical weather of the Carolina seacoast and its many hurricanes. In 1854, a fourth-order Fresnel lens replaced lamps and reflectors. A Confederate lookout station during the early portion of the Civil War until its capture by Federals in 1862, the lighthouse was heightened to 87 feet in 1867 when the war damage was repaired with a new light room and a new fourth-order Fresnel lens. A new two-story keeper’s cottage, as well as a cistern and boat house, were built at this time. After a 1968 fire destroyed the keeper’s cottage, a rotating Coast Guard crew manned the lighthouse until 1986, when the light was automated and the crew relocated. Interestingly, the oldest lighthouse in South Carolina was the last in the state to be automated. Now under state control, belonging to the South Carolina Heritage Trust as part of the Tom Yawkey Wildlife Preserve, the lighthouse is on the National Register of Historic Places.